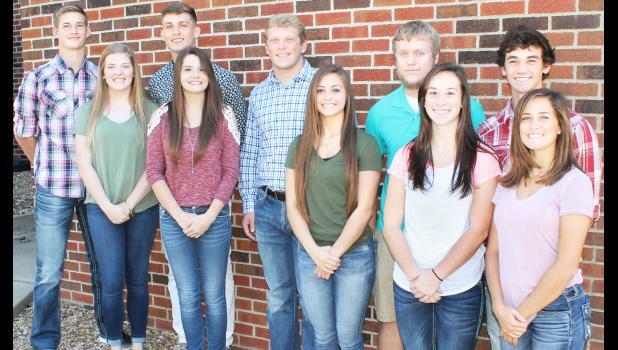 Two of these Holton High School students will be named homecoming king and queen prior to the start of Friday’s Wildcat football game against Royal Valley. Queen candidates, from left on front row, are Emma Wittmer, Sydney Prine, Ashlyn Weilert, Courtney Boswell and Cali Smith; king candidates, from left on back row, are Tyler Price, Spencer Baum, Tel Wittmer, Aaron Bain and Brady Forrester. Coronation will take place at 6:30 p.m. Friday at the HHS football field, where the game will start at 7 p.m. There will also be a homecoming parade that day, set to arrive on Holton’s Town Square at about 2:30 p.m., it was reported.